BAL went for it on 4th and 6 on the NE 36 when up by 7 early in the 3rd quarter. 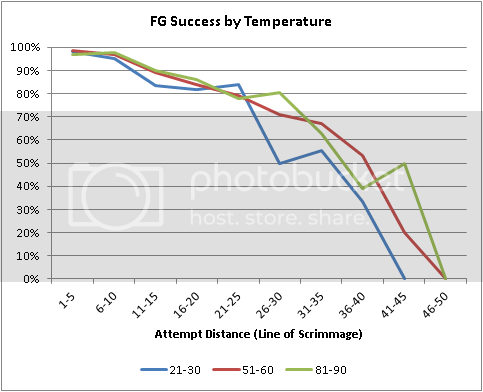 My new model says FG, mostly because guys like Justin Tucker have become more accurate at these longer ranges. But due to the conditions, it was probably the right call. Only about 20% of coaches go in similar situations. BAL converted and went on to score a TD. BAL's (team adjusted) WP peaked at this point at 89%. The problem with that sequence, however, was that BAL burned a timeout in the process. This can be costly, and as we saw, BAL had a 2-minute drill to try to win it. An extra timeout cost them between 1 and 2% of WP. Nothing to sneeze at. Those kinds of things add up. My thoughts on the controversy regarding NE's ineligible receivers on the line was that I agree with John Harbaugh: It was "deceptive" and "devious." But so is the play-action pass, and the practice is legal under the rules. But to be fair, I interpret Harbaugh's complaint as saying that the practice went against the purpose/intent/spirit of the rules. Defenses, by rule, are supposed to be allowed to identify eligible receivers. But why? The purpose is for the defense to be able to substitute and matchup accordingly. That's the point of the required announcement of eligibility. NE was defeating BAL's ability to substitute and matchup by snapping the ball only a few seconds after the referee's announcement. In NE's possessions following Harbaugh's complaint and penalty, the refs appeared to manage the process to allow BAL more time, which suggests NE got away with one there. Whether you agree or disagree with the practice is probably a function of which team you're rooting for, but I'll bet the mortgage that the league quickly either re-writes or clarifies the rules to prevent offenses from doing this in the future. It's precisely the kind of thing the current rules were trying to preclude. So bottom line to me is it seems marginally legal yet un-sporting. On the other hand Baltimore's intentional safety at the end of the Super Bowl a couple years back was legal but could be considered equally unsporting, but I thought it was brilliant. Everyone knows I grew up in Baltimore, so take everything I wrote with a grain of salt. Later, on 4th and goal from the 7, BAL elected for a FG attempt. This was the right call. The break-even success required would have been .46, but league average is .24. It's amazing that NE didn't call a running play once in the 2nd half, and only 7 RB rushes all game. I guess I shouldn't have been surprised after doing an analysis of what would happen if a team decided not to run at all. Looking at the team strength-adjusted WP graph, the line is almost flatly horizontal from beginning to end, which means this game went down exactly as predicted, or perhaps "on schedule." Wilson had a great game against a good defense with 0.42 WPA and 16.9 EPA. CAR took away SEA's running game and forced Wilson to beat them, and he did. Down by 7, shortly before halftime, CAR went for it on 4th and 1 from the SEA 27. Good call of course, especially when you're a big underdog, but CAR blew a timeout in the process. There was only a minute remaining at that point, and time and yards eventually caught up with them. The drive ultimately ended with a FG. Next year, CAR needs to mix up its snap cadences on FGs. Man. During halftime Jimmy Johnson must have said something about how it's better to get the ball back after an interception than after a punt, all else being equal. On Twitter, Brian Montgomery asked me if Johnson was correct that a team can expect more EP after an interception compared to a punt, given the same field position. My answer: Of course not. This is just another variant of the momentum mythology almost all coaches subscribe to. Rodgers struggled early. At one point, after GB's first three possessions, he was 50% for 3.5 YPA. 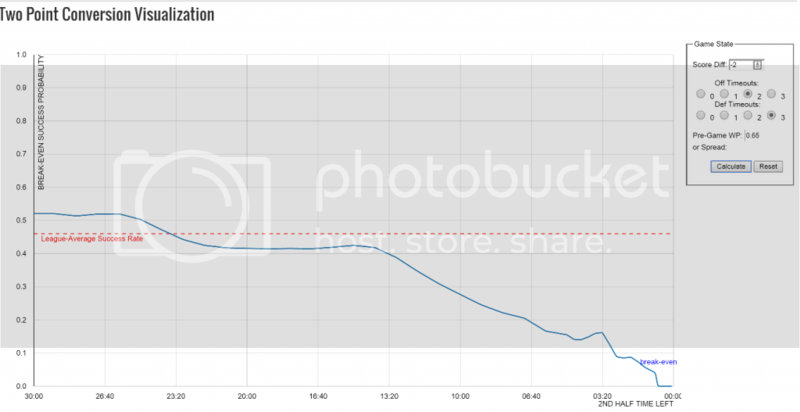 That equated to a -1.8 EPA and -0..8 WPA with just a 30% SR. He went on to finish with 0.67 WPA and 15.4 EPA, though. As Keith dissected already, GB had some problems with 2-point conversion strategy. Late in the 3rd quarter GB scored a TD to make it 21-19 DAL. They should have gone for the conversion here. The break-even success rate is below the league-average from the 10-minute mark onward in the 3rd quarter. Here's a screenshot from the 2-pt interactive viz (usually available only to clients). 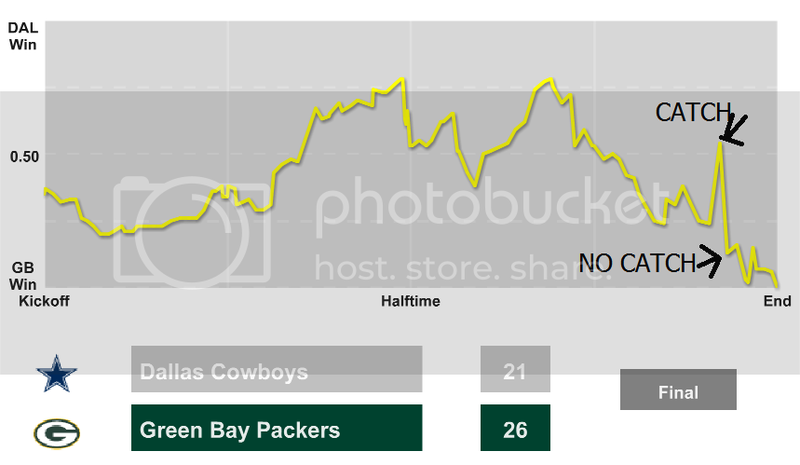 Later in the game with 9:10 to play in the 4th qtr, GB scored another TD, this time to go up 5. Here they elected to go for the 2-points to make it a 7-point game. A good call. The overturned catch/no-catch by Bryant is what everyone is talking about. You don't need any fancy WP model to tell you how big of a play that was. Of course, it was a no-brainer for McCarthy to challenge it. Anyway, here's what the swing looked like on the WP graph before and after it was overturned on replay. When GB was trying to run out the clock, they faced a 3rd and 11 at the DAL 35 coming out of the 2-minute warning. The run/pass decision was a big one. An incomplete pass meant that DAL might get the ball back within a score with 1:48 left to play (but no timeouts). A run more than likely sets up a long FG attempt but burns an additional 40 seconds or so. This is a good task for the WOPR game simulator. The simulated WP for a run is .959 and for a pass is .947. So the sim likes a run there, but it's not aware of Aaron Rodgers, so it's hard to criticize the play call. But holy hell, imagine if it were incomplete and DAL came back to tie or win. With 2:32 left to play before halftime, IND gained possession at their own 3. They managed to convert and get out to their own 14 with 1:54 left. Neither team was using its timeouts nor even being aggressive with clock management. Phil Simms was trying to explain this and said that it was good for both teams to wait and see what happens on IND's initial series before committing to trying to score. It is possible for neither team to want to burn a timeout, but at this point in the half, timeouts opportunities dwindle. One or the other team has a better chance of scoring at this point, and that team should be aggressive. If it's DEN they should be using their timeouts on defense, when they save the most time. If it's IND, they should at least be playing hurry-up 2-min drill-style. I think either (or possibly both) coaches were excessively cautious, which is not uncommon. Down by 11 late in the 3rd qtr, DEN went for it on 4th and 1 from the 36. This was a slam dunk easy decision. Even though they didn't go on to get a TD on the drive, it allowed a much shorter FG try...which was a bad call, and here's why. Trying the FG at that point virtually guaranteed that DEN would be 8-points down, needing a 2-pt conversion to tie the game if they scored again. Two-point conversions are good a little over 45% of the time, but as I wrote on Twitter at the time, 4th and 4s are also converted successfully 45% of the time. It was also a bad idea because it assumed IND would not go on to score a FG...which is exactly what happened. Ultimately DEN fell behind by 11 and were eliminated from the game long before their last possession. Had they been able to score a TD rather than a FG on that 4th and 4, it's likely they would have been down by 7 points and in contention rather than by 11 points and all but dead. This isn't the best way to think about things, admittedly, but it illustrates why the numbers come out the way they do.